This is probably one panel of a multi-paneled composition. 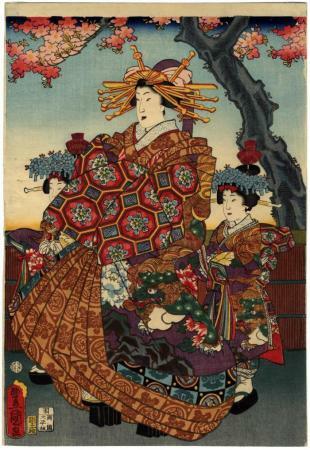 The courtesans elaborate kimono is decorated with a lion and peonies. This is similar to another print of a high ranking prostitute in the Lyon Collection, an Eizan print, produced approximately fifty years earlier. See #731. According to the Japan Arts Council web site the carver Horikō Masa (彫工政) is the same person as Matsushima Hori Masu (松嶋彫政). See Lyon Collection #1397.